This exercise is based on recent crystallographic research on the olivine crystal structure published by Redfern et al. (2000). The authors of this study synthesized Fa50 olivine olivine (MgFeSiO4) in an experimental apparatus at temperatures ranging from 100 to 1250 °C, quenched the experiments, and used in situ neutron powder diffraction techniques to investigate changes in the synthesized olivines as a function of temperature. While this study reports cutting-edge materials research carried out with the latest crystallographic techniques, the results are educationally instructive and illustrate important concepts normally covered in an undergraduate mineralogy course. 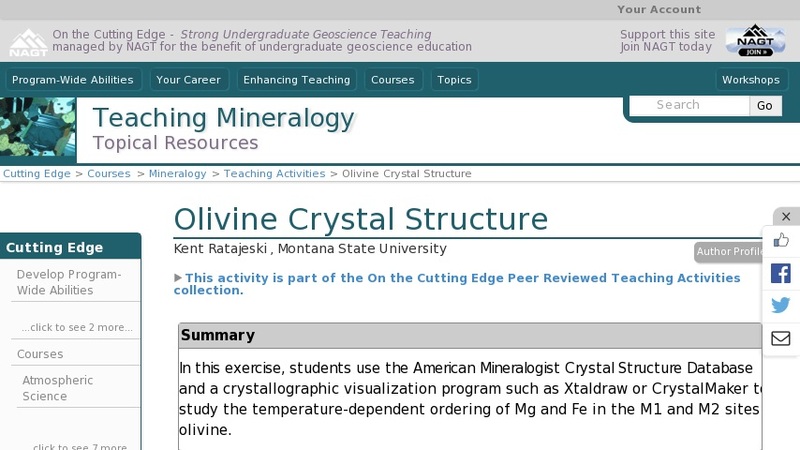 In this exercise, students are guided into the American Mineralogist Crystal Structure Database to retrieve and download published crystal structure data for viewing in either the CrystalMaker or XtalDraw visualization software packages. The students are instructed on how to manipulate the structures and are asked to plot some of the crystallographic data from this study on graphs using a spreadsheet program such as Excel.